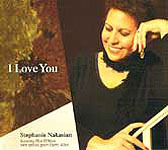 Stephanie Nakasian has had many facets to her career. She was a banker in Chicago and Manhattan. Then she caught the jazz bug. She heard bebop pianist Hod O’Brien, started working with him a bit in 1980 and a year later quit her day job to become a full-time singer. She built her chops as a two-year member of the vocal group, Jon Hendricks and Company. She married O’Brien, and figured out how to balance motherhood, performing (often with her husband) and a long career as a music educator at the University of Virginia and the College of William & Mary. These days, she’s known to some as rising star jazz vocalist Veronica Swift’s mother. On Friday, February 11, Nakasian’s quartet performance in Venice FL illuminated her vocal artistry. The wide-ranging program was a palette for her swinging style and bebopping finesse. Her scatting was never overdone. She used it sparingly – and effectively – to put a different twist on familiar fare. She also put a fine spin on several tunes that aren't heard much today. Her rhythm section included three fine Florida-based pros: Richard Drexler on piano, Don Mopsick on bass and Tony Vigilante on drums. Her poignant take on “These Foolish Things” was a heart-felt tribute to O’Brien, who died two years ago. She followed it with “The Man I Love,” which featured with a bit of horn emulation. Her technique this time around sounded like a growling muted trumpet solo as she traded phrases with Drexler. Her take on Ann Hampton Callaway’s beautiful ballad “You Can’t Rush Spring,” a composition that she said ought to be considered as a jazz standard.The South County Jazz Club matinee concert was held at the Unitarian Universalist Congregation of Venice.